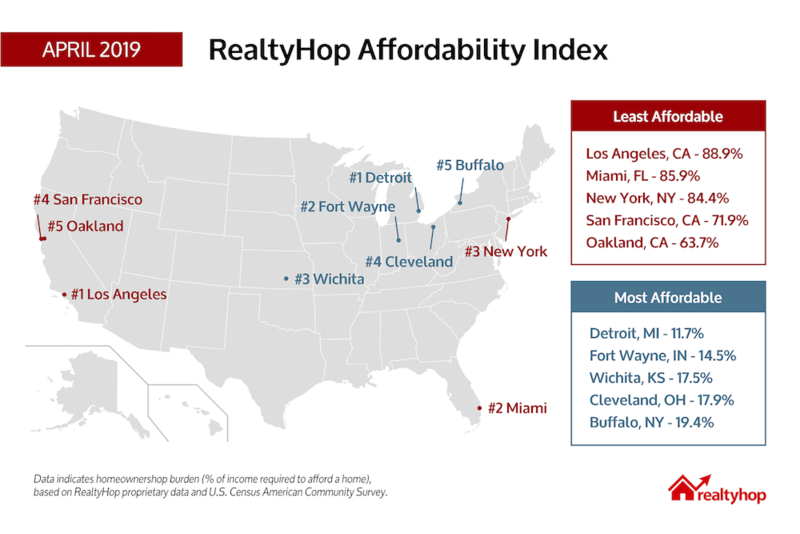 In this April installment of the RealtyHop Housing Affordability Index, we investigate the decision to purchase a home in the 100 most populous cities across America. Is homeownership affordable or even possible for the average family in each city? Every month we analyze proprietary RealtyHop data alongside comprehensive Census data to find out. See how your city fares in affordability. 1. Los Angeles, CA was again the most cost burdened city in America for homeowners this month. Given standard mortgage and tax rates, a median property requires monthly payments of $4040.29, meaning that the average household would have to spend 89% of their monthly income to own a home. 2. Miami, FL was the second most cost burdened city for homeowners this April. While home prices are more affordable compared with other major cities, Miami had the lowest median household income of those in the Top 5. Homeownership requires 85.93% of monthly income for the median household. 3. New York City, NY was again the third most cost burdened city this April. Despite dropping about 1% month over month for cost burden due to a decrease in home prices, the median household in the city still has to spend over 84% of their income on housing costs. 4. San Francisco, CA saw a decrease in cost burden of 1.71% this April, due to slightly cheaper property prices. While the city did experience a dip, home sales prices remained the highest of any city on our index at $1,265,000. The median household should expect to set aside 71.9% of their income towards home ownership costs. 5. Oakland, CA was again the 5th most cost burdened city in America this April. The average family should expect to pay 63.7% of annual income towards homeownership costs. 1. Detroit, MI was the most affordable city in America for homeowners this April. In fact, due to a slight dip in home sales prices this past month, the city got even cheaper, requiring only 11.73% of median income to afford a home. The average mortgage plus taxes only amounts to $272.18 per month. 2. Fort Wayne, IN moved to the second most affordable housing market this month, as the city’s homeownership burden dropped by 3.17%. Affordable home prices with a median of $114,900 were met with solid household income of $45,853. 3. Wichita, KS was the third most affordable housing market this April, with the city seeing median home prices drop to $139,000. The average household should expect to pay only 17.53% of their income toward home ownership costs. 4. Cleveland, OH saw an increase of 1.5% for homeownership costs this April, dropping it three spots on our affordable list. became more expensive for home. Despite this increase, the city was still very affordable for homeowners, requiring only 17.9% of median income for costs related to owning a home. 5. Buffalo, NY made our most affordable list for the first time this month, as costs related to homeownership dropped 5.37%. This change was due to a decrease in overall housing costs, to a median home sales price of $104,900. The average household should only expect to allocate 19.42% of income toward costs related to homeownership. Boston, MA cracked the top 10 least affordable housing markets for the first time, up 4 spots to 8th place. The city required the average household to allocate 56.34% of their income toward homeownership costs, up 2.31% in the month. Sacramento, CA dropped one spot on our list, as the city saw homeownership become more affordable this April. A drop in home prices contributed to a drop of 5.4% in our homeownership burden index. The city is far from cheap, however. Home owning households pay 42% of their annual income toward housing costs. Houston, TX came in at 26th place on our list of the most unaffordable places for homeowners, down seven places. Despite being pricey, the city actually became considerably cheaper in April with a drop in home prices. The median household can expect to pay 38.4% of income toward housing costs. Charlotte, NC became less affordable this past month, with homeownership burden increasing 5.25%. The city jumped 9 spots to 39th on our list, with the average family requiring 34.84% of total household income to afford the median home.